Goaltender Frederik Andersen will start for Toronto when the Maple Leafs host Sidney Crosby and the Pittsburgh Penguins Thursday night. Maple Leafs goalie Frederik Andersen will get the start when Toronto hosts the Pittsburgh Penguins tonight. Leafs head coach Mike Babcock made the announcement following today's morning skate. 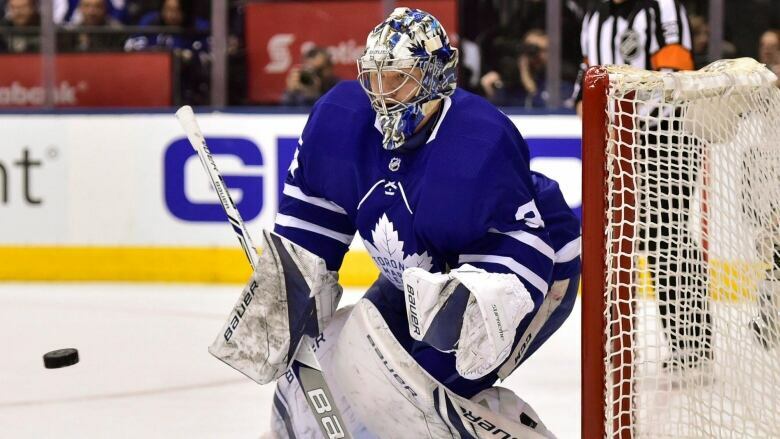 Andersen missed Toronto's 4-1 home win over the Los Angeles Kings on Monday after he suffered a minor knee injury in Saturday's 4-2 victory against the Capitals in Washington. Penguins head coach Mike Sullivan, meanwhile, said Matt Murray (concussion) will start for the Penguins following a three-game absence. Leafs No. 2 goalie Garret Sparks made 33 saves to get the win against the Kings. Eamon McAdam, an emergency recall from the Newfoundland Growlers of the third-tier ECHL, served as the backup with Andersen on the shelf. Babcock said after the game that Andersen would be ready to face the Penguins, but the netminder's status remained up in the air following a brief appearance at practice Tuesday before Wednesday's off day. The 29-year-old Dane, who didn't speak with reporters after Thursday's morning skate, is 4-1-0 with a 3.02 goals-against average and an .899 save percentage this season. The Leafs don't currently have a ton of organizational depth after Andersen and Sparks. Toronto lost Curtis McElhinney and Calvin Pickard on the waiver wire before the start of the season, while Kasimir Kaskisuo of the American Hockey League's Toronto Marlies was injured over the weekend. Jeff Glass, the Marlies' backup, is on an AHL-only contract. "The one thing about the league is things all kind of settle out over time," Babcock said when asked about the Leafs' depth. "Usually goalies come available. "I'm comfortable with Sparks' second game and the way he practised."